Hi All, In this post lets discuss about creating a System/System Object that connect's to MDM System. Prerequisites: Super Admin access in Portal and deployement of all MDM related relevant business packages on portal (after that the system template will be available under new system). 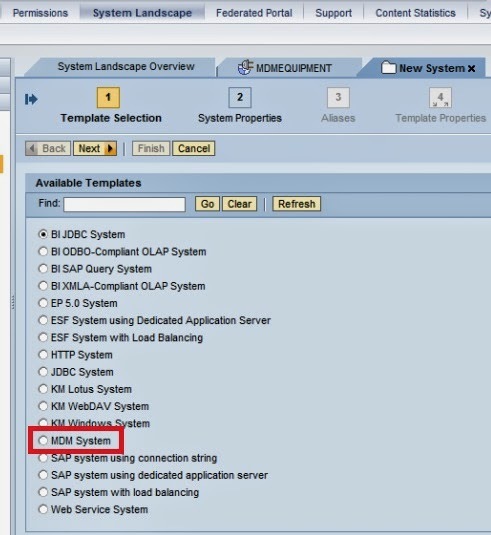 Each iView of MDM must be connected to a system object derived from the MDM system in order to connect to a specific back-end application. An MDM system object always references a single MDM repository. Navigate to System Administration >> System Configuration . 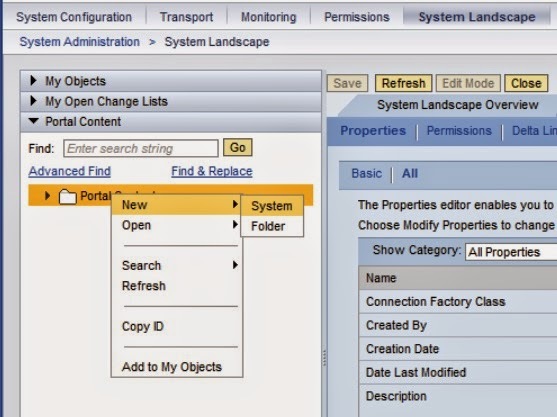 In the Portal Catalog, create a new folder or choose one that contains portal systems. In the context menu of the folder, choose New >> System (from template) to create a system object using the system wizard. 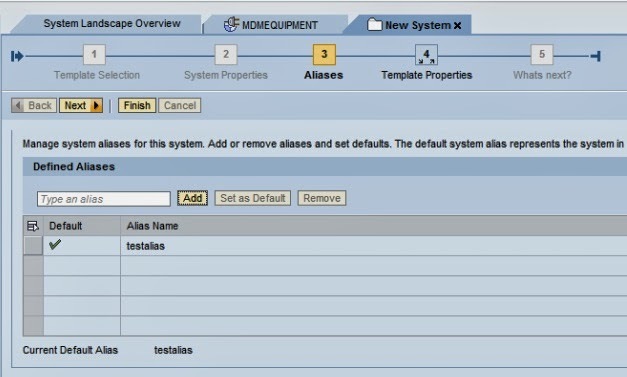 In the Template Selection step, select MDM System. In the Aliases step, enter the name of the alias and choose Add. The name of the alias appears in the Defined Aliases area. Choose Modify Properties (right hand side of the screen). In the Show Category dropdown box, select Connection Properties. Enter the host name of the server on which the MDM server is running. Entering the password (MDM Console password) is optional. To connect to an MDM server on a host running multiple MDM servers, you must enter the port number of the server that you want to connect to. For example: <server name>:<port number>. Leave blank if you want to use the user's logged on language; otherwise enter the language you require. Repository Name: Enter the name of the repository you want to connect to. Select the checkbox in the Value column to use a secure communication channel to the MDM server. In this case, the MDM server name must include the number of the secured port. To use a secure connection, you must first import a certificate (. crt file) to the dedicated key store view named MDMKeystore on your application server. For more information about the certificate, see: Start of the navigation path Managing Connections and Sessions Alternative Session Creation Method End of the navigation path → Enabling Secure Connections in the MDM Java and .NET API Guide. For more information about secure connections, see the Network and Communication Security section in the MDM Security Guide. To display workflow jobs and tasks for a table, enter the <tableCode>. To display the number of records and the display value of the linked records to the job or task, enter <tableCode> followed by ~<number>, where <number> represents the number of records to display in the UWL. 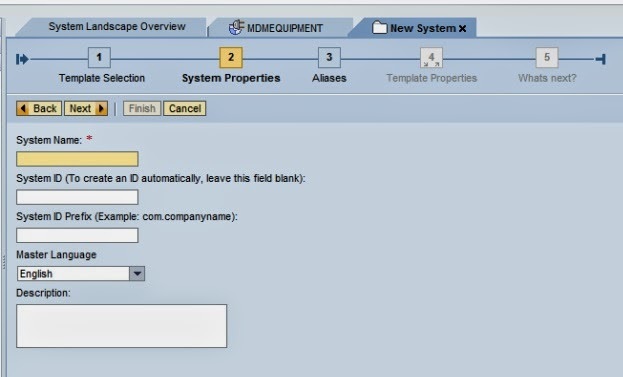 For more information, see SAP Service Marketplace at http://service.sap.com/installmdm71 → How to Work with UWL and MDM Workflows in the Portal. Used to normalize display of Unicode characters. The default is NotNormalized. If some characters are corrupted, consider changing this value to NormalizationComposed (for example for Japanese or Korean). Log on to the Portal as system administrator. Navigate to System Administration System Configuration . In the context menu of the folder, choose New System (from template) to create a system object using the system wizard. System Name Enter a system name ( usually a combination of repository and server name. System ID Enter the ID name without spaces. System ID Prefix (optional) Enter the ID name with a com.companyname prefix. Master Language Leave as the default. In the MDM Server Properties step, define the MDM Server by entering the host name of the server on which the MDM server is running. 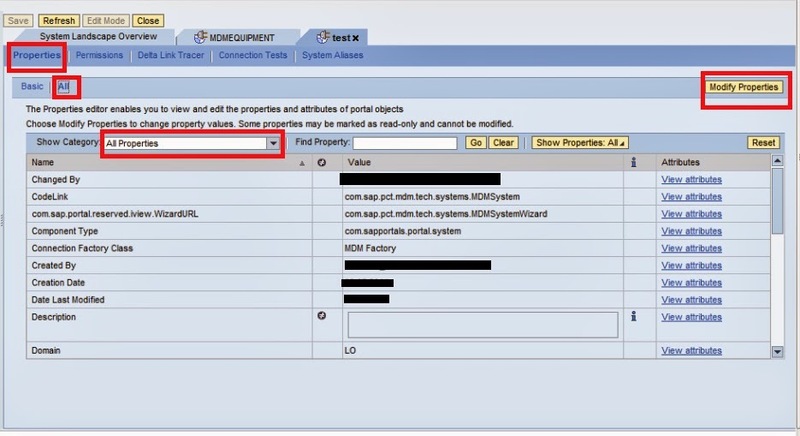 To connect to an MDM server on a host running multiple MDM servers, you must enter the port number of the server that you want to connect to. In the Select Repository step, select the repository you want to connect to from the dropdown list. In the Select Language step, leave the default [Automatic (Defined by User’s Language)] if you want to use the user's logged on language; otherwise select the language you require. In the Summary step, (showing a summary of the configuration), select Finish. In the Display dropdown list, select System Aliases. Enter the name of the alias and choose Add. Refresh the system template list before using it.